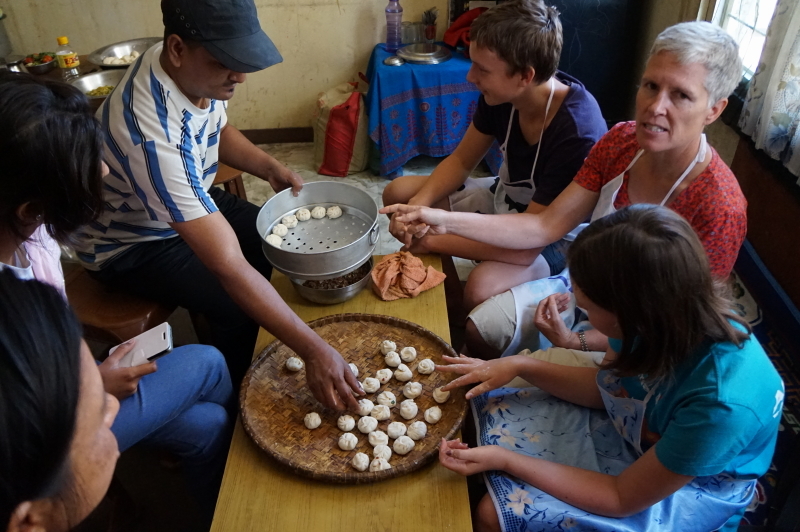 Momo Making in Kathmandu | Hello Cool World! Eva here. 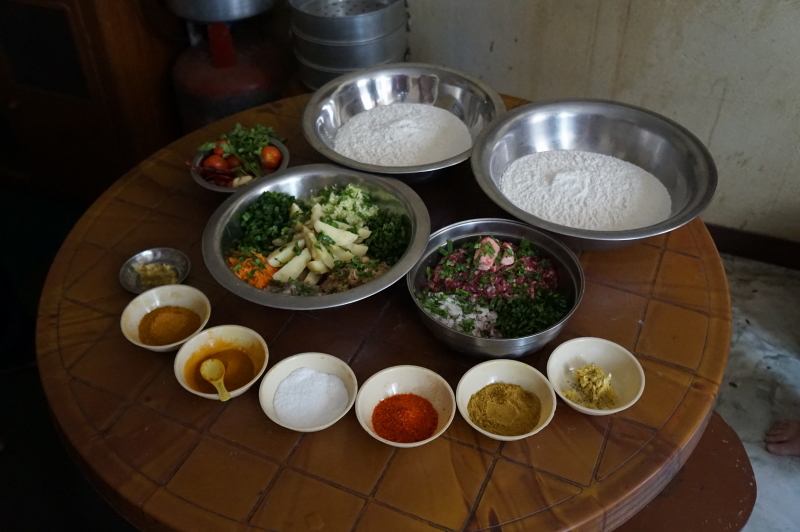 On one of our last days in Kathmandu, we went to a Backstreet Academy, momo making lesson. Backstreet Academy is an on-line organization in some Southeast Asian countries that offers courses where local people teach traditional arts. The day of our lesson, we took a taxi to Fire and Ice, a restaurant which we went to when we were first in Kathmandu. Kriti, the facilitator, met us there and took us to our host’s house. 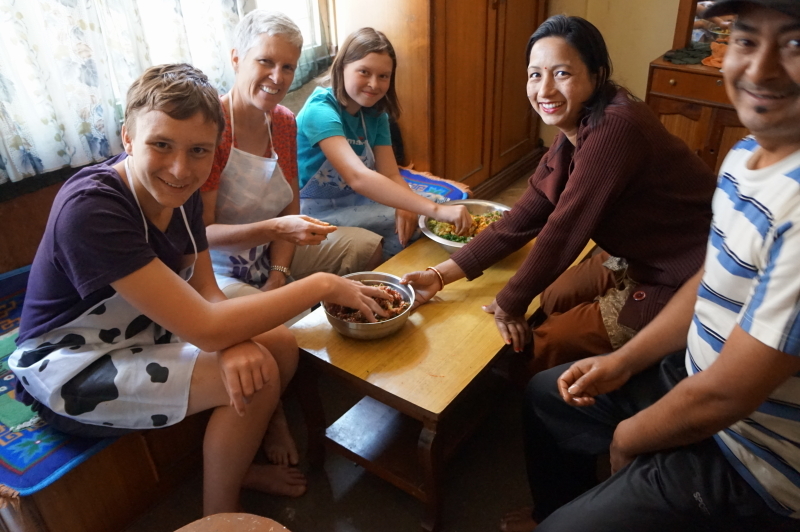 When we arrived we were kindly greeted by Dil and Purna, our hosts and momo teachers. 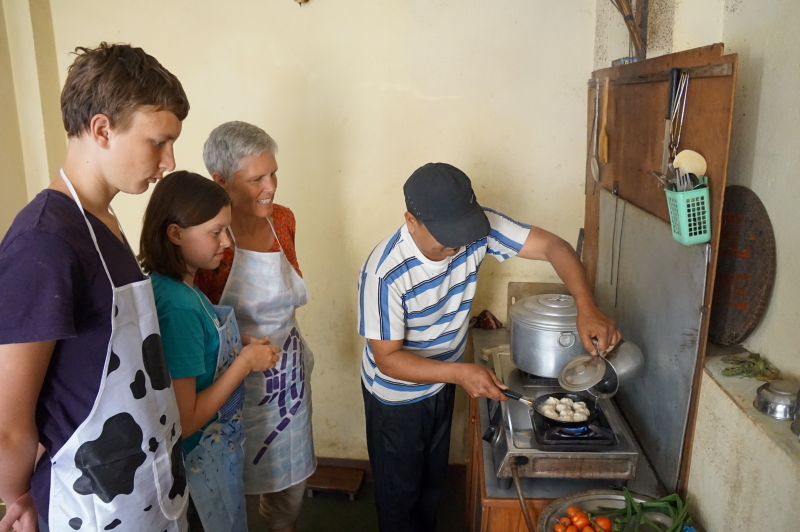 Dil and Purna sat us down and showed us the ingredients. We went to work and soon found that when you make the dough it has to end up nice and soft. 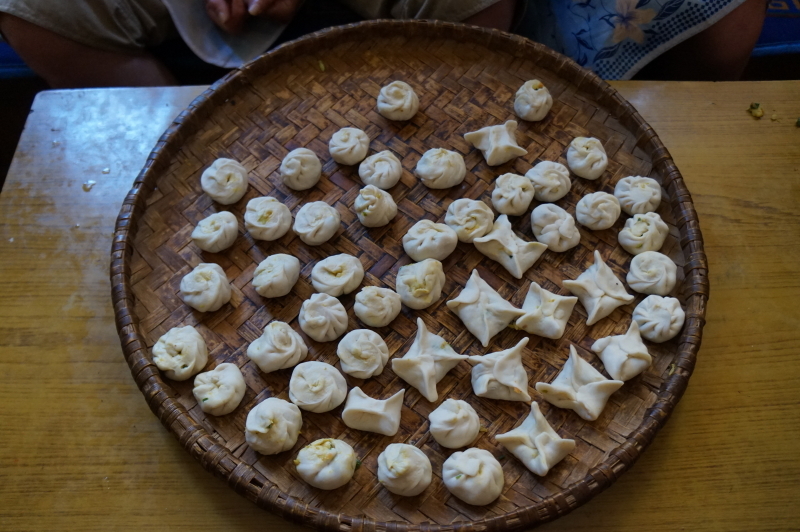 When we twisted the momos into shape, I also found out that I am better at making star-shaped momos than the normal twisted ones. 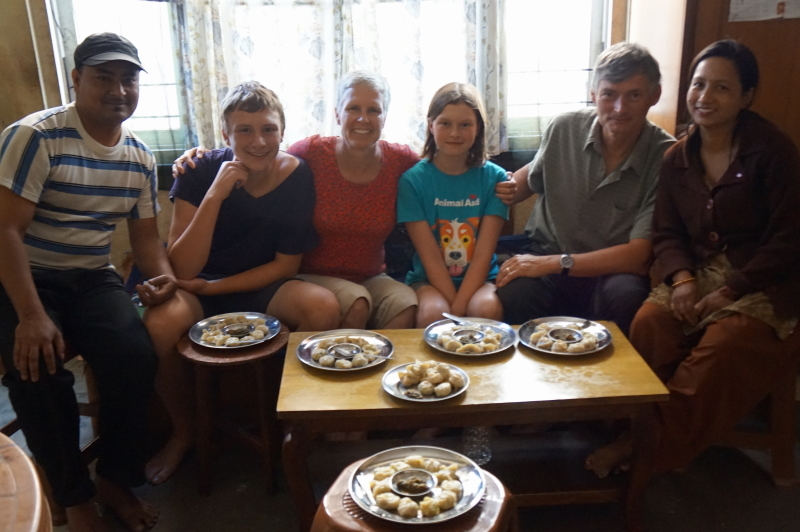 I will now list out the recipe for momos in case any of you want to make some. Add water to refined flour and knead it until the dough is smooth. Cover with a damp cloth so that the dough does not go hard. They did not say how much flour or water to use; just keep adding water to flour and knead until it is smooth and not sticky. Finely chop the onions, ginger and garlic and mix it with the minced meat and oil. Add the spices according to your taste. Mix it well. Add an egg if you want. Finely chop the cabbage, carrots, masaura, and parsley. Blend oil with garlic and mix it with the carrots and finely chopped vegetables. When you have everything ready you can make the dough into balls. Don’t make them too small or too big. Squash them flat and make sure they stay in a circle and that they don’t get too thin. Then take the filling and put small blobs of it on the flat dough. If you want to do a star version you take one edge and fold if into the center. Do that with each corner then squeeze the corners. If you want to make a traditional twisted one, it’s a bit trickier. Hold the momo in your left hand with your thumb ready to press down the filling. With your right hand, lift an edge of the dough and pinch it, then reach forward and pinch a little more dough while turning the momo. Keep turning and pinching ten times, pressing the filling down with your left thumb. After ten times, you should have almost no hole left at the top and curvy lines in the momo from all the turning. Fold the top over and you are done! Once you have all your momos made, put them in a steamer and steam for about 15 minutes. If you want, you can fry them in a pan. Once the bottoms are a little brown, add a little water and cover so they steam. Dil also made a dipping sauce to go with the momos. It was a mix of a lot of spices, along with roasted red tomatoes. 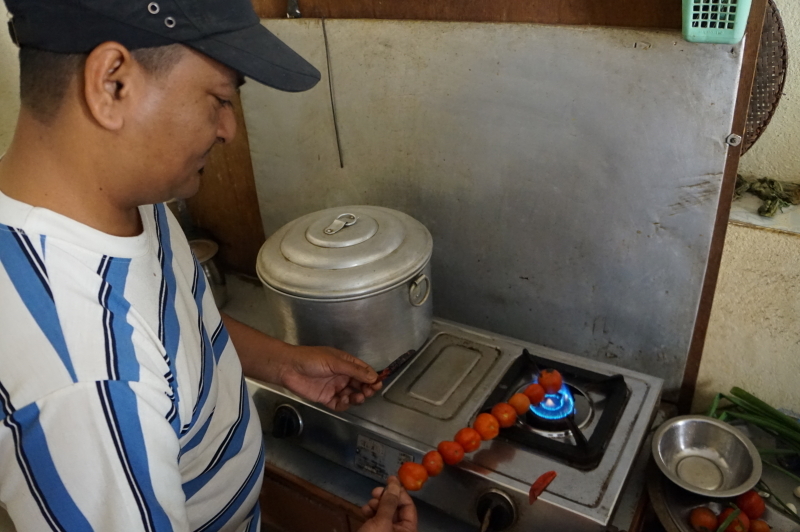 Here he is roasting the tomatoes over the stove. 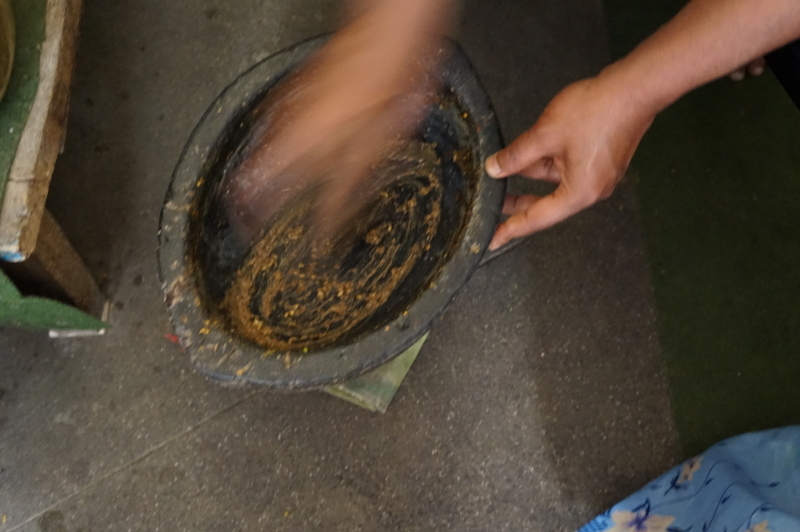 He then peeled and ground them, along with a bunch of spices, to make a paste. Then the next and most important step is to eat and enjoy!